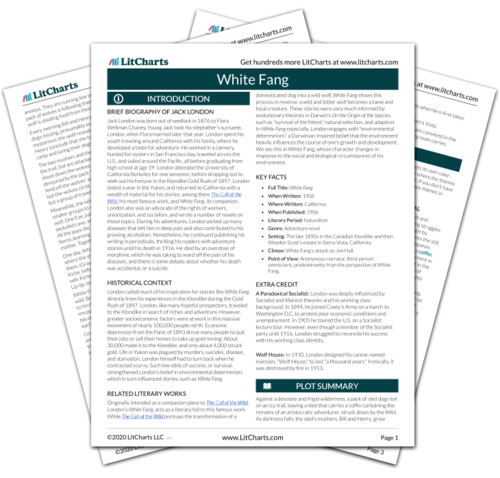 Welcome to the LitCharts study guide on Jack London's White Fang. Created by the original team behind SparkNotes, LitCharts are the world's best literature guides. A concise biography of Jack London plus historical and literary context for White Fang. A quick-reference summary: White Fang on a single page. In-depth summary and analysis of every chapter of White Fang. Visual theme-tracking, too. Explanations, analysis, and visualizations of White Fang's themes. White Fang's important quotes, sortable by theme, character, or chapter. 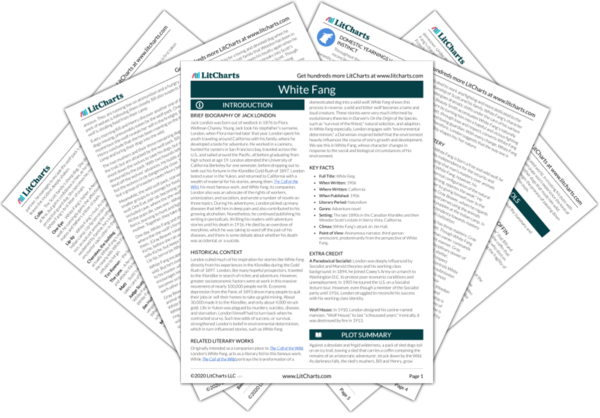 Description, analysis, and timelines for White Fang's characters. Explanations of White Fang's symbols, and tracking of where they appear. An interactive data visualization of White Fang's plot and themes. Jack London was born out of wedlock in 1876 to Flora Wellman Chaney. Young Jack took his stepfather's surname, London, when Flora married later that year. London spent his youth traveling around California with his family, where he developed a taste for adventure. He worked in a cannery, hunted for oysters in San Francisco bay, traveled across the U.S., and sailed around the Pacific, all before graduating from high school at age 19. London attended the University of California Berkeley for one semester, before dropping out to seek out his fortune in the Klondike Gold Rush of 1897. London lasted a year in the Yukon, and returned to California with a wealth of material for his stories, among them The Call of the Wild, his most famous work, and White Fang, its companion. London also was an advocate of the rights of workers, unionization, and socialism, and wrote a number of novels on those topics. During his adventures, London picked up many diseases that left him in deep pain and also contributed to his growing alcoholism. Nonetheless, he continued publishing his writing in periodicals, thrilling his readers with adventure stories until his death in 1916. He died by an overdose of morphine, which he was taking to ward off the pain of his diseases, and there is some debate about whether his death was accidental, or a suicide. London culled much of his inspiration for stories like White Fang directly from his experiences in the Klondike during the Gold Rush of 1897. London, like many hopeful prospectors, traveled to the Klondike in search of riches and adventure. However, greater socioeconomic factors were at work in this massive movement of nearly 100,000 people north. Economic depression from the Panic of 1893 drove many people to quit their jobs or sell their homes to take up gold mining. About 30,000 made it to the Klondike, and only about 4,000 struck gold. Life in Yukon was plagued by murders, suicides, disease, and starvation. London himself had to turn back when he contracted scurvy. Such low odds of success, or survival, strengthened London's belief in environmental determinism, which in turn influenced stories, such as White Fang. Originally intended as a companion piece to The Call of the Wild, London's White Fang, acts as a literary foil to this famous work. While The Call of the Wild portrays the transformation of a domesticated dog into a wild wolf, White Fang shows this process in reverse: a wild and bitter wolf becomes a tame and loyal creature. These stories were very much informed by evolutionary theories in Darwin's On the Origin of the Species, such as "survival of the fittest," natural selection, and adaption. In White Fang especially, London engages with "environmental determinism," a Darwinian-inspired belief that the environment heavily influences the course of one's growth and development. We see this in White Fang, whose character changes in response to the social and biological circumstances of his environment. Setting: The late 1890s in the Canadian Klondike and then Weedon Scott's estate in Sierra Vista, California. Climax: White Fang's attack on Jim Hall. Point of View: Anonymous narrator, third-person omniscient, predominantly from the perspective of White Fang. A Paradoxical Socialist: London was deeply influenced by Socialist and Marxist theories and his working class background. In 1894, he joined Coxey's Army on a march to Washington D.C. to protest poor economic conditions and unemployment. In 1905 he toured the U.S. on a Socialist lecture tour. However, even though a member of the Socialist party until 1916, London struggled to reconcile his success with his working class identity. Wolf House: In 1910, London designed his canine-named mansion, "Wolf House," to last "a thousand years." Ironically, it was destroyed by fire in 1913. Campodonico, Christina. "White Fang." LitCharts. LitCharts LLC, 15 Dec 2013. Web. 23 Apr 2019. Campodonico, Christina. "White Fang." LitCharts LLC, December 15, 2013. Retrieved April 23, 2019. https://www.litcharts.com/lit/white-fang.